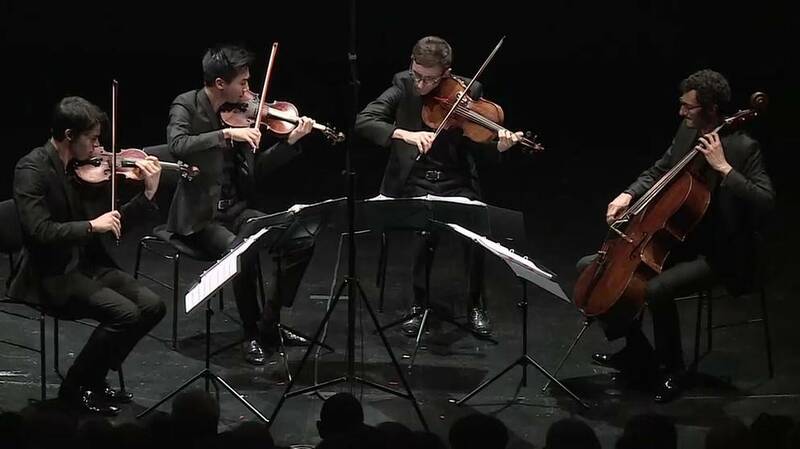 With all four members only in their early twenties, the Paris-based Arod Quartet has already dazzled chamber-music lovers in concerts at such prestigious venues as the Auditorium of the Louvre in Paris and the Verbier Festival in Switzerland. They record exclusively for Erato Warner Classics, which released their debut Mendelssohn disc in Fall 2017. The Arod quickly came to international attention when they won the coveted First Prize of the 2016 ARD International Music Competition in Munich, having already taken First Prize at the Carl Nielsen Chamber Music Competition in Copenhagen. In 2018-19 the Arod will make its American debut, featuring its inaugural Carnegie Hall performance, following its North American debut premiere at the Festival Lanaudiere in July 2018. The 2017-2018 season saw the Arod Quartet perform at the Auditorium of the Louvre, the Philharmonie de Paris, London’s Wigmore Hall, Salzburg’s Mozarteum, the Konzerthaus in Vienna, Amsterdam’s Concertgebouw, the Tonhalle Zurich, the Calouste Gulbenkian Foundation in Lisbon, Portugal; and in Italy, Japan, Denmark, and Serbia, and saw the group join the prestigious BBC New Generation Artists’ roster. Mozart: String Quartet No. 17 in B-flat Major, aka "The Hunt"